While October has a gluttony of games that fit the theme of the month there isn’t anything that feels like a real November game. What’s the deal there? November isn’t a bad month, it’s got beautiful colors in nature, you get to wear sweaters, and if you’re American you get one of the best holidays. I feel like there’s a lot of great stuff in there that could translate well into games. But for some reason it’s never really taken. With our collective failure to produce autumn themed games please accept this grouping of awesome games to try out this week. If you’re in the mood for some arcade action you won’t get much better than Tormentor X Punisher. Strap in for a demon blasting good time that avoids any unnecessary elements like plot, progression, or dialogue that doesn’t include swearing. 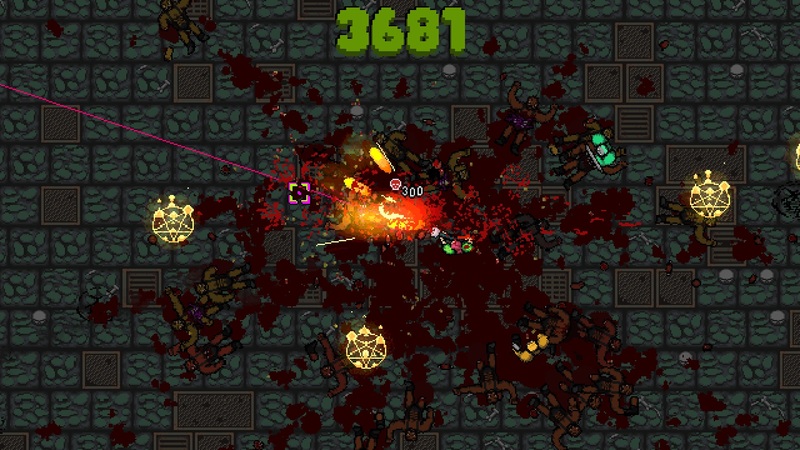 You’re dropped into a demon pit with an unending horde of hellspawn and nothing to stop them but your guns and wits. Everything in universe dies in one hit, including yourself, so you restart on a roughly a minute to minute basis but I never felt frustrated while playing. TxP has become one of my go-to games to fill time while waiting for events and I can’t recommend it highly enough. If Tormentor X Punisher appeals to you, it’s also worth mentioning that a good portion TxP’s publisher Raw Fury’s catalog is also available on itch.io. Resident Evil 4 is a classic game with an inventory system is equivalent to cramming square blocks through an impossible number of round holes. 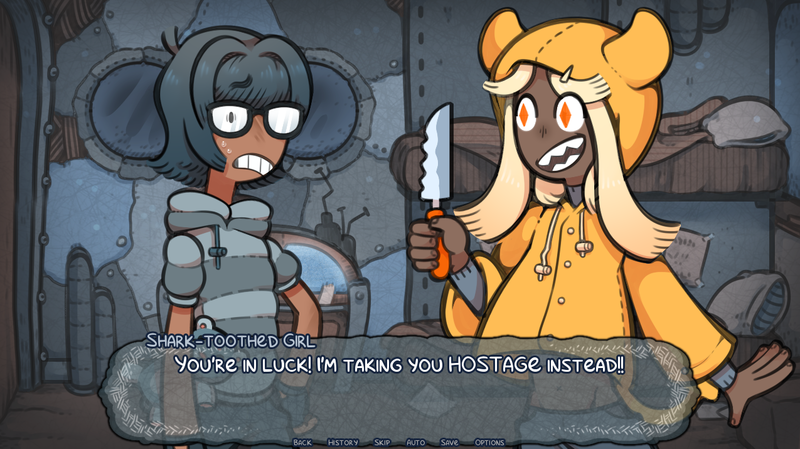 And yet, the creators of Jack and Casie took this practical nightmare and spun it out into a full game. To set your expectations appropriately, this is just a demo to inspire confidence in Jack and Casie’s Kickstarter campaign, but I had a lot of fun with this short slice of the game. To understand the dynamics of Jack and Casie you need to think of it in two halves. 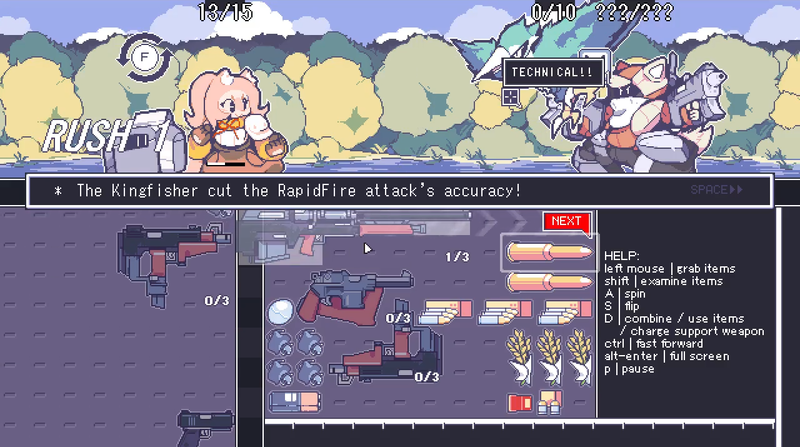 The top half is a light RPG that involves shooting preposterously complicated guns at various enemies, while the bottom half is this Resident Evil-style inventory management with a ceaseless conveyor belt of oddly shaped items to wedge into your dwindling available space. It’s a shockingly good time and I’m interested in seeing where the final version of the game goes. You thought you could make it a week without me recommending a visual novel? You thought wrong. This week we’ve got Disaster Log C from the team at Sofdelux. It’s a breezy little adventure about being held hostage on a rickety boat while everything you’ve ever known is sunk in a flood. You may think that I’m being sarcastic when I call it a breezy adventure, but despite it’s incredibly grim subject the writing and characters are all fun and bouncy. You can’t be too surprised when you realize that it comes from a team that mostly writes romantic visual novels --and they haven’t really escaped that here-- but Disaster Log C feels like a fresh take on the genre. Are there any games we missed this week? What have you been playing? Let everyone know in the comments below. Set in the 90's, Kathy Rain tells the story of a strong-willed journalism major . Everything in Tormentor❌Punisher can be killed in one hit, from bosses to yourself.